I have to admit that I didn’t have high hopes for Copenhagen. I’d read the updates of the negotiations from Bonn, Bangkok and Barcelona. I knew they hadn’t made enough progress to pull together something substantive. 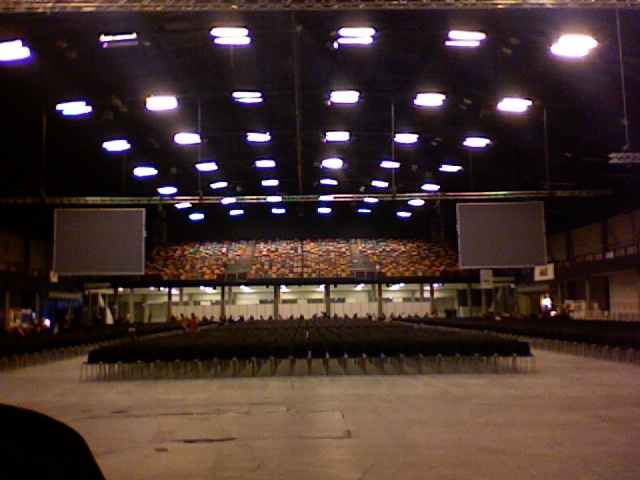 So when I entered the Bella Center I was under no illusions as to any impact I could have and spent my first week twittering on where the free food was and meeting interesting people. In 2050 he will be 64 years old. Walking the halls of the Bella Center this morning it was eerily quiet. There were no bright-colored shirts, chanting youth, polar bears or walking trees. The energetic, chaotic, raw emotion of democracy was gone. Everything was neat and orderly and very, very surreal. 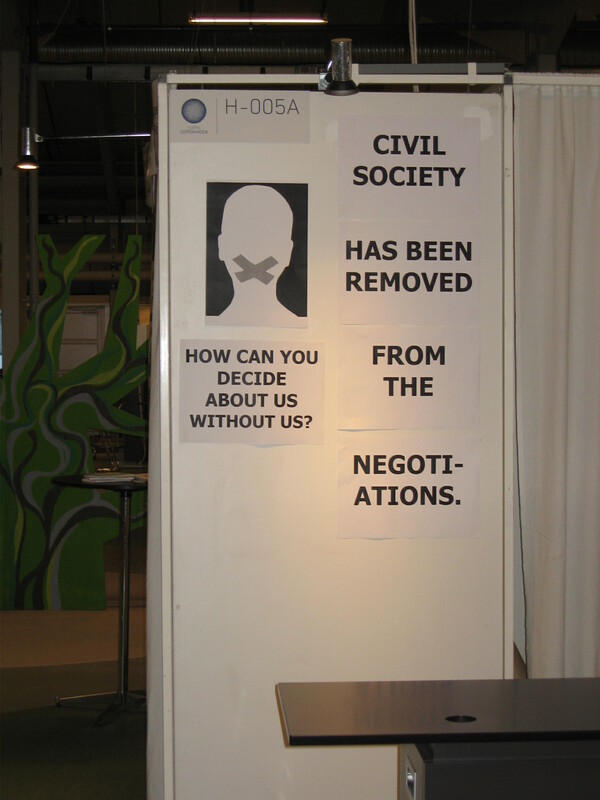 Several of the NGO booths at the expo area had stark black and white signs that said, “Civil Society has been removed from the negotiations. How can you decide about us without us?” Very sobering. I don’t really understand what the UNFCCC Secretariat is thinking. 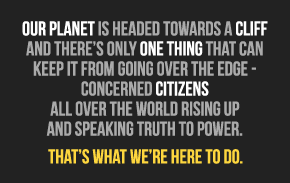 Aside from the legal obligations for public participation, the whole UNFCCC’s existence owes itself to the efforts of Civil Society. It is the scientists, research institutes, advocacy groups and activists that have gotten the world to even think about climate change. Funny way to acknowledge that debt. But acknowledging debts isn’t one of the strengths of the official bodies when it comes to climate change. After running the gauntlet of five security checks with two detours to constituency meetings and to abandon my backpack, I finally made it into the High Level Segment – Heads of State statements. I listen as presidents, prime ministers and even princes exhorted each other to reach an agreement and protect the earth. Some used their soap box to rail against US capitalism, Russian imperialism, or other political hobgoblins, but most genuinely seemed to feel the eyes of the world on them as they tried to “seal the deal” (in the less than 24 hours we have left.) One of my favorites was Brazil, though I am not sure that the American government was so thrilled. But at least Lula de Silva didn’t rail about US aggression and the evils of capitalism for 21 minutes like Mahmoud Ahmadinejad did. Iran also put a strong plug in for developing nuclear power. Nice touch Mahmoud. Many of the speakers echoed the arguments that we have heard all week (or perhaps for years) from their various negotiating blocks. Still, the stories of the prime ministers of the small island developing states and African nations were heart-wrenching. There were memorable quotes, Zapetero of Spain finished his statement by saying that “our planet does not belong to anyone but the wind.” Gonzi of Malta noted that “Climate change will define us … what we do here is our legacy.” And my favorite, “My children will be asking me in 20 years, ‘Dad, what were you thinking?’” from Gordon Bajmai of Hungary. Where civil society once was. Many of the leaders repeated their country’s already public green house gas commitments. Europeans were rather smug and superior; Australia and others of the umbrella group were defiant and dismissive. But I was also struck by how many said that “the negotiations could not fail,” that there was “too much at stake.” Several made direct reference to the demonstrations over the past week as a reflection of the frustration that the people of the world are feeling as the negotiators stall and bicker. They might want to give that message to their negotiators. My overall favorite was Nicholas Sarkozy of France. He repeatedly challenged the other heads of state by asking “Who would dare say…” that Africa and the least developed countries don’t need money to adapt to climate change? That we don’t need innovative financing? That we don’t need a body to check compliance. … It was great. He scolded the US and China both for not finding a compromise and proposed that the leaders themselves sit down after dinner and hammer out a political agreement. Grandstanding, yes. But in a refreshing and inspiring way. As I looked around in the public gallery while the Prime Minister of New Zealand finished up, I noticed a total of 12 people sitting in the chairs. All of the people who want to be there, who wanted to witness this moment, and there are only 12 of us. The rest are locked out, perhaps watching it on-line somewhere. Perhaps they have given up and are out enjoying the snow-blanketed city. Maybe the press will convey the inspiring words to the world (well actually the Prime Minister of New Zealand wasn’t that inspiring) but then again, all of these speeches may have just contributed a little more hot air to the atmosphere. And unfortunately that is something the world can do without. For added context to my previous blog post. 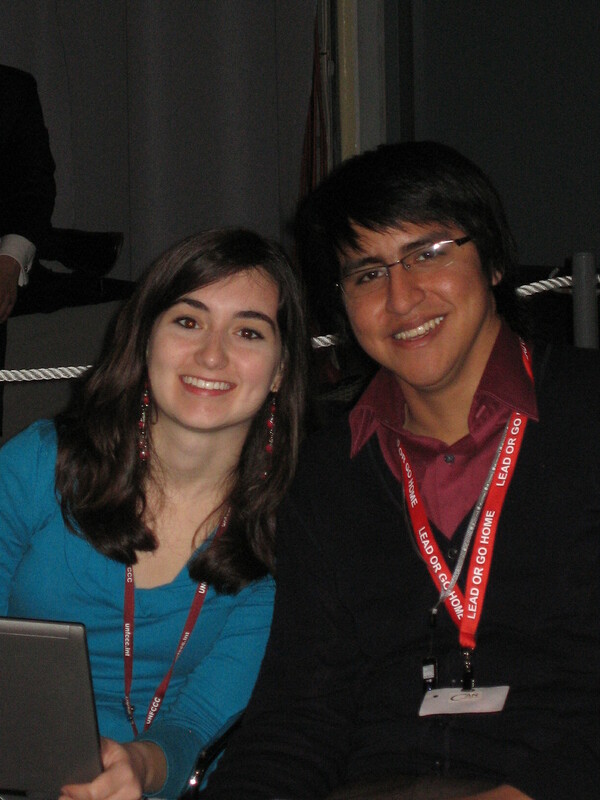 It is vital that non-governmental organizations representing civil society ranging from College of the Atlantic and the Climate Action Network (CAN) to the Indigenous Peoples are involved in the process for several reasons. The most important reason is to hold countries accountable and to push them to make bolder pledges. 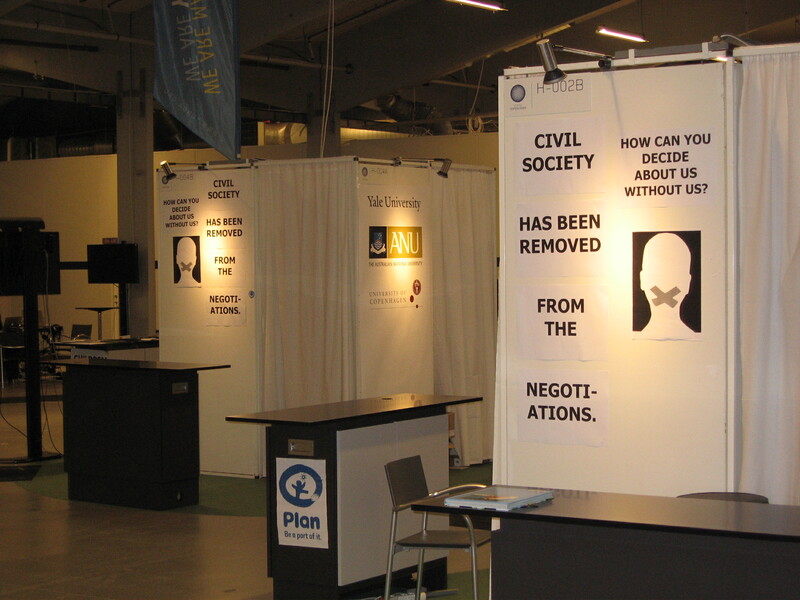 Civil society is a recognized constituency of the UNFCCC. Its presence in official proceedings is necessary to make sure all parties are playing by the rules and not shutting out those with less power. Civil Society participation is also necessary to give a voice to the millions of people who do not have a voice at COP and whose governments don’t speak on their behalf. 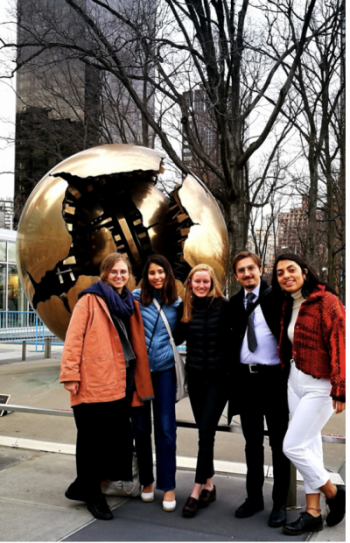 Finally, civil society presence is needed in the proceedings to push for a fair, ambitious, and binding deal in Copenhagen for the world can’t afford to wait until COP16 in Mexico City for a deal! We need action now! I’m going on three days straight sitting here in the hostel largely because I have been sick, but also because I have no place better to be considering that almost all NGOs have been shut out of the Bella Center since Tuesday. NGOs have been forced to follow conference proceedings from satellite locations unable to show their presence and voice their opinions in official COP proceedings as mandated by the The Aarhus Convention, which was ironically negotiated in Denmark and which the Danish government has ratified. Excluding civil society is not only a disgrace, but a violation of international law. 1. Know how many people your conference center can hold! Although everyone including myself wanted to be at this conference, it does no one any good to accredit three times (45,000) the amount of people the center can legally hold (15,000). That the Danes didn’t know this or see this coming is inconceivable to me. 2. Adjust to circumstances accordingly. With mobs of accredited people with badges trying to get into the Bella Center, someone should be smart enough to separate the accredited and those seeking accreditation. That they had the same problem day after day and didn’t seek to remedy it is unacceptable. Even people with secondary badges had to wait in line with everyone else. And I was one of the lucky ones that only had to wait in line for an hour – some, even party members, were forced to wait in the cold for up to 8 hours on Monday. 3. Don’t hold an international conference, accredit thousands of NGOs and then shut them out of plenary sessions. Letting thousands of NGOs into the Bella Center only to let them roam the halls and attend side events is not why any of us spent countless hours fundraising the thousand-plus dollars we each needed to travel to Copenhagen! I wish Mexico City best of luck in not repeating the mistakes of Copenhagen!